Again Jill has delivered a fabulous product and service. She picked up a typo I made that I never wouldn’t have noticed without her eagle eye! Thanks Jill. Love Millie’s new Go Go Gecko Lupine collar and Dog Tag Art matching tab! It’s very bright and colorful. One of my new favorites! As always, excellent service. This is not a puppy-proof tag. My puppy was able to latch onto it while wearing his collar. The ID portion can easily slip out of the holder with little effort on the pup's part. I would not buy again. Pet Expectations Response I am sorry your puppy was able to chew the plastic bumper off the edge of your Dog Tag Art pet tag. 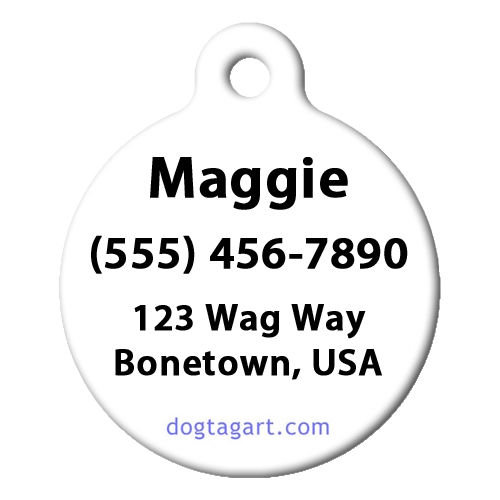 If you'd like a replacement or if there was any damage to the pet tag, please don't hesitate to contact me.